Guide: bulk Power Bank prices. Price includes your logo printed or engraved in one position. Delivery and VAT extra. Flat rectangular metal Power Bank. It features a very extensive metal surface, which is ideal for branding because it can accommodate even large-size printed logos or graphics. Power Sharp can be customised on both sides using silk-screen printing or laser engraving. Colours: Gold, Silver, Black, (Pantone for 1000 qty). Universal USB cable to recharge most telephone or tablet devices on the market. Universal multiple USB cable to recharge the majority of mobile phones or tablets on the market. Window Box XXL: Small rectangular cardboard box with a clear window to see the product inside. The packet includes the Power Bank and the USB cable to recharge it immediately. Custom Window box: Cardboard box with customisable colours and sizes. It has a transparent window so the product can be seen. 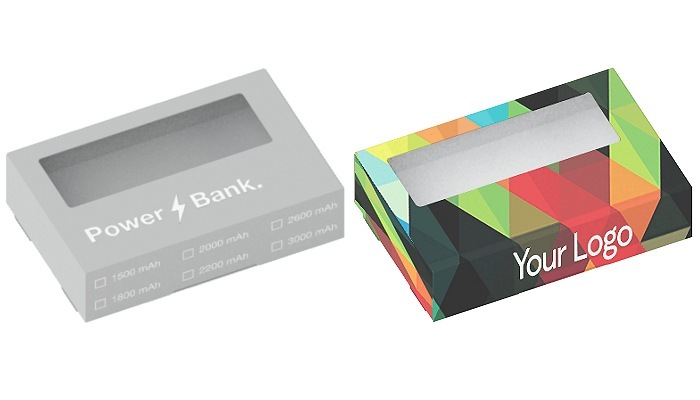 You have the option to place the Power Bank on a thermoformed support or left loose inside the box.